There are over 200 different species of hibiscus plants in the world, and each variety differs in size, shape, and color. When someone refers to a hibiscus plant, it is hard to differentiate between the different types of Hibiscus flowers, but luckily, many of the species of hibiscus can be separated into two categories: tropical hibiscus and hardy hibiscus. 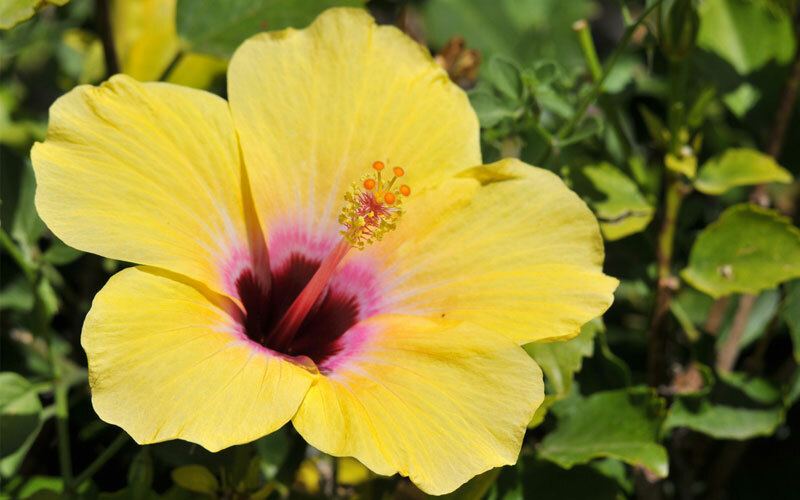 Let’s discuss each variety of hibiscus and explore a few of the more popular species in each category. Tropical hibiscus is a variation that is not able to withstand cold temperatures or climates that are below a tropical level. They produce blooms that are bright in color; with red orange, yellow, pink, and white blooms being the most common. Tropical hibiscus also has deep green foliage that is glossy to protect it from the intense heat of the tropics. These tropical plants can grow in cooler regions of the world, but if they are not indoors in a greenhouse atmosphere, you can start treating this plant as an annual because it will die when the weather turns cold. Let’s explore a few beautiful tropical hibiscus plant variations. Simple Pleasures – This is a traditional variation that has nine to ten inch blooms. The flower is bright red in the center and as you get closer to the tip of the petal, it will turn pink in coloration and the ends will be a vibrant yellow. The stigma in the middle of the petals is bright yellow, just like the outer edge of the petals. 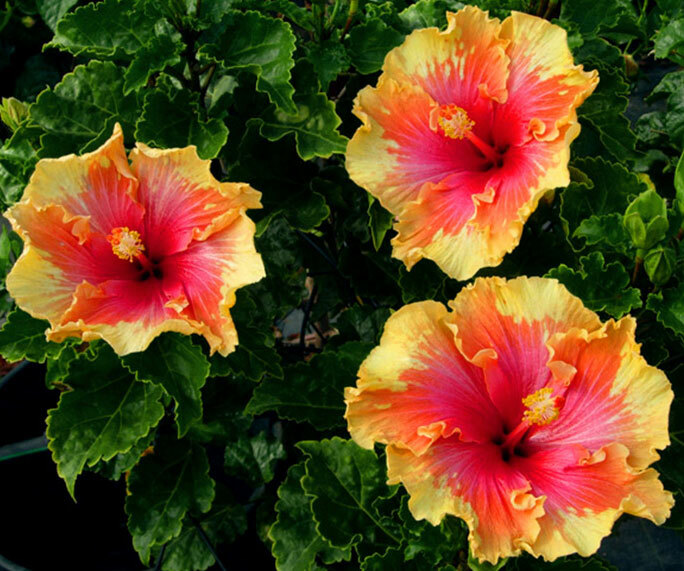 Palm Springs – This variety of tropical hibiscus has extremely vibrant blooms. They typically produce blooms that are six to eight inches in diameter. The center of the bloom is a bright orange coloration that looks almost star-shaped from the distance, and the outer edges of the petals are a vibrant shade of deep yellow. Bedazzled – This tropical variation is actually a double hibiscus, so it has a ruffled pettiskirt look that is simply breathtaking. The six to eight inch diameter blooms have an amazing deep orange coloration that stands out amongst the dark green foliage of the plant. 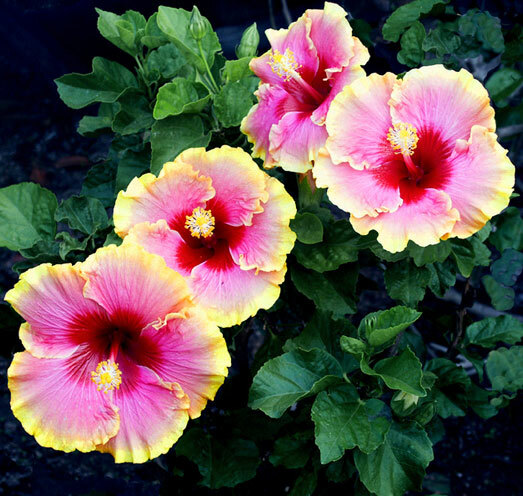 Aphrodite – This tropical hibiscus plants has become a symbol for love. Named after a Greek goddess, this fuchsia colored bloom is a vibrant seven to nine inch flower. The edges of the petals include a soft orange rim that makes the plant a rare, yet beautiful specimen. Hardy hibiscus plants are able to live throughout the winter. Typically, the plant is pruned down before winter begins and the new growth will form from the existing root system. When the plants are pruned, they should be cut back to roughly six inches above the ground. The blooms of these hibiscus flowers are still red, pink, and white, but the coloration is a bit less vibrant. This muted color effect also makes the leaves a paler green than the tropical variation. What are some hardy hibiscus varieties? Lord Baltimore – This hardy hibiscus plant features bright red blooms that are ten inches in diameter. The petals are quite large and they slightly overlap with one another. The ruffled edge and bright coloration make this a bloom worth seeing, even though each flower will only be in bloom for a single day. Blue River II – This variation is a hibiscus that features pure white blooms that grow to be six to ten inches across. The white flowers almost make your garden glow at night, and even though the blooming period season for this hibiscus is not very long, over 240 blooms will appear throughout the spring and summer for you to enjoy. Kopper King – This variety is a plant that has a 12inch wide bloom. The flower is bright pink in the center, and as you move closer to the outer edges of the petal, you will notice the pink coloration becoming lighter until it is nearly white. The leaves on this variation are unique as well; in fact, they resemble a red and green maple leaf. Scarlet Rose Mallow – This variation features a set of three to seven gorgeous red petals that are placed in a pinwheel-shaped fashion. The flowers are six to eight inches across and they will only be in bloom for about a day before they begin to wilt. As you can see, each species of hibiscus is different from the next. Some are small with purple ruffled blooms while others have blooms that are massive with three different colorations in a single petal. With this much variation, it is possible to have an area in your garden that is dedicated to hibiscus plants. Not a single plant will be the same, and the hibiscus blooms will be simply amazing.